Wishing all of our Western riders the best of luck as they race the East in Quebec this weekend for rounds 5 & 6 of the Canadian CEC Enduro Series. We haven't confirmed exactly who all is attending, but Second Gear Club riders include Jason Schrage, Ben Rego, Cole Dobovich, Matt Coonfer, Lexi Pechout, and Amber Giroux. Other Western racers include Bobby Prochnav, Chantelle Bykerk, Tyler Murray, Victoria Hett, Jack Sawatsky, and Ryan Gruffunder. There is at least another 10 riders from the west. A great turn out for certain. 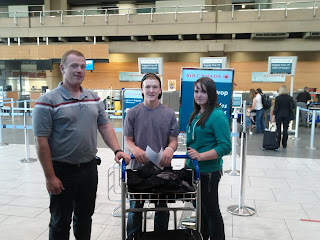 Matt and Lexi boarded the plane tonight to Montreal accompanied by Scott Coonfer. They have confirmed that their bikes have arrived at Labelle. Hopefully there will be a bit of time for some site seeing as well as racing. Race takes place on the local ski hill, Mt Tremblant. All the best to everyone! What an adventure!